I’ve decided today to write about something other than sewing. Shocking, I know. I haven’t been motivated much to get any sewing done, so this is my lame attempt to change the subject. The awesome thing about my “job” is that if I don’t feel like doing it, I don’t have to. Yesterday I went to the local thrift store. It is one of my favorite places to shop. I bought several books there, one of which was Wicked. I have heard nothing but wonderful things about this book. Any book that inspires a Broadway musical HAS to be good, right? That’s my theory. So far, I’m loving it. When I got it home and cracked it open, the first thing I noticed was the illustration of the map on the first page. Have you ever noticed that books with maps in them are always fantastic? Take the Lord of the Rings trilogy, for example. Maps. I love stories that are so complex, and have so many characters and places, that you need a map for reference to keep them all straight. The gist of this book is basically how the wicked witch came to be wicked in the first place. It is fascinating to me to think of why people are the way that they are. What makes them tick. It is a great realization when you finally discover that bullies wouldn’t be bullies if only someone had paid attention to them or gave them any affection. It is never so simple as “that kid is mean”. The complexities of humans never cease to amaze me. The tiniest little thing can change the entire course of our lives. Mind boggling. This is our latest listing. It features fun and bold fabrics in all of your favorite fall colors. I know it’s not a kaleidoscope quilt pattern. I named it that because all of the colors reminded me of looking into a kaleidoscope (also, I didn’t know there was a pattern with that name until I finished this one… I’m still learning!) I think this turned out very nicely. I had a few remnants left over and I decided to use them rather than toss them away. I was unsure of what to make since the pieces were pretty small, so I just began to sew them together. I ended up with a pretty adorable pillow. Just to be safe, I need to add that a pillow should never be placed in a crib with a baby. It is purely for decoration only. The pillow could be used as a cute accent on a rocking chair, or perhaps a window seat, in the nursery. I love the bright colors. It’s so cheerful! I think any baby would love to cozy up in this lovely blanket. Now, if you’ll excuse me, I’m off to make back-to-school gifts for my kids teachers. I’m so excited that school is starting again! Two weeks and counting! This is the quilt I was working on during our family vacation at the lake. It is 65″ x 78″, a great size for a twin bed. Stitching by the lake was something I had never done before. It was so serene and peaceful. I hope a little of that transferred into the quilt. May those good vibes give whomever purchases this quilt many wonderful nights sleep. I just got home today from my last vacation of the summer. The family and I went to Lake O’Sullivan. It was incredibly hot and my husband is now hot pink. We took our trailer up to the lake and were gone for four days. Floating around in inner tubes, soaking up the sun, and sucking down a few ice cold beers; that is a perfect weekend. By a sheer twist of fate, it ended up being a bit more relaxing than I had expected. I am normally attached to my phone. I have it on me all the time and I feel naked without it. The morning we left for our camping trip, I plugged it into the computer and noticed that I had a software update. I updated it, and my phone crashed. I was furious! I didn’t have time to restore it so I had no choice but to leave without it. It really is something odd to not hear little chirps echoing from my pocket every few minutes. I’d hear a bird and then touch my pocket out of habit. I’ve realized that I don’t like that about myself. Once in awhile it is good to disconnect with everyone else, and re-connect with your kids and your spouse instead. I’ve been working on a new quilt for a couple of weeks and I only have the binding left to finish. I brought it with me to the lake. I got up at 6 o’clock every morning. I would walk the dog, brew a pot of coffee, and then sit by the lake sipping my coffee while I hand stitched the binding down. There was something so peaceful about it and I found myself stitching really slowly because I was paying so much attention to the beauty all around me instead. If I could pack up my life and move it to the lake, I think that just might make me happy. Have you ever thought about the influence your most cherished baby blanket has carried in your life? Maybe it’s just me. This is my baby blanket. My aunt Eileen is quite an artist and created this piece. She painted the fabric and quilted this some thirty years ago now. (This old quilt!!) 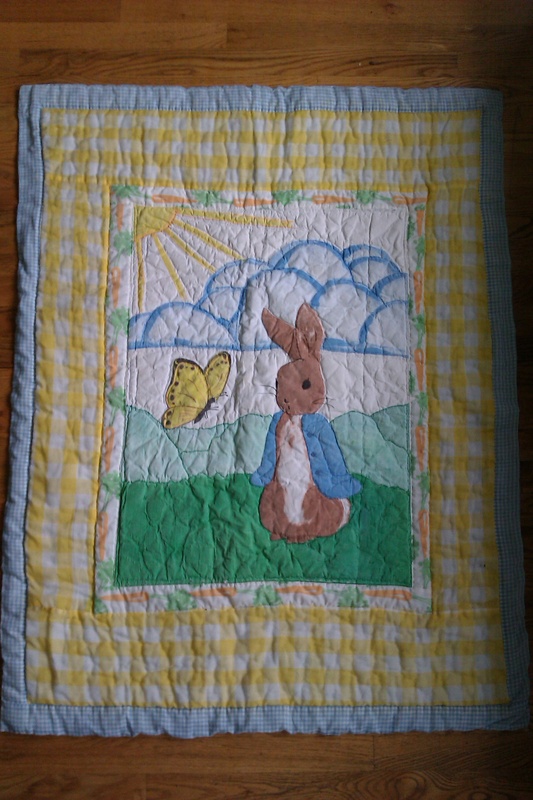 I was looking at my children’s baby quilts when it struck me how much my baby quilt has influenced not just my quilting, but my taste in fabric. Little did my aunt know at the time that choosing a simple blue and white gingham backing fabric would become such a focus for me. I made my first quilt when I was 16, purely on a whim. No real reason, I just felt compelled to make something. It was for a boy, and it was hideous! At the time, I was quite proud of my work. It was a simple nine patch made from scraps around the house and a few pieces I’d picked up at Joann. All novelty prints, and no rhyme or reason whatsoever. I also tied it. Anyhow, the one unifying fabric was the blue and white gingham I’d used to sash and back it with. I later married that boy. (And yes, I still have that quilt in a locked closet. Do not ask to see it.) When we married, we registered for household necessities, and I chose gingham lampshades. I later chose blue gingham sofas for our second home. *Protip* If you think you will ever have children or indoor pets, do not get gingham sofas. Just sayin’. Gingham sort of became a theme in my fabric choices. The quilt that really sucked me into quilting, my first daughter’s baby quilt, is also backed in gingham, but pink this time. Even my second daughter’s quilt has gingham. These weren’t conscious choices, but one of those things that when you look at as a whole, you finally see the trend. It’s not just my aunt’s choice in fabric that I admire now. She has always been a fiber artist in every respect and really does not adhere to anyone’s “rules” on how to create. It’s nice to be reminded that you don’t always have to do things the “right” way. That’s where innovation takes over and you can create something truly unique and spectacular. Anyway, this quilt I drug around with me everywhere was loved to bits. My mother was kind enough to restore it for me last year and it now is regarded as an “untouchable quilt.” It’s simply too special to me to be dragged around by another generation. It is now treated as the work of art it truly is. Market bags are the easiest way to help the environment. 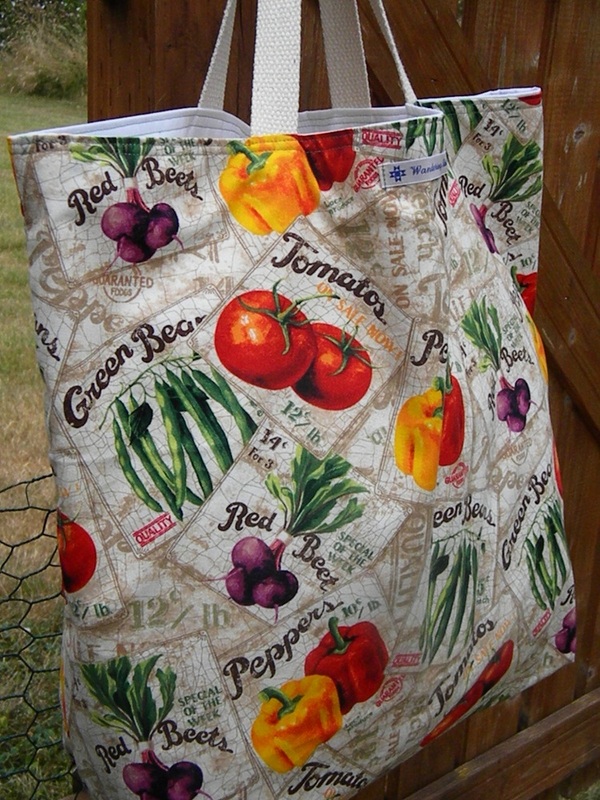 A market bag is a bag you take the the grocery store or farmers market. 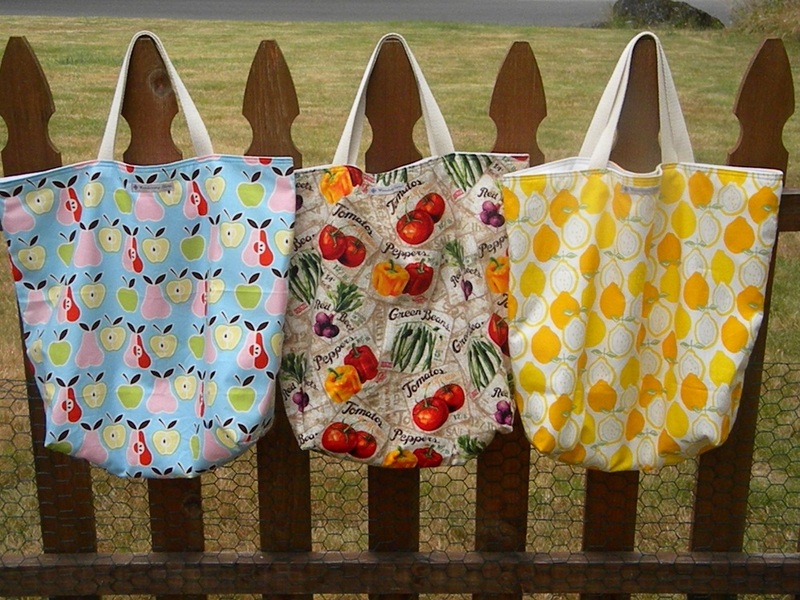 Using these reusable bags is much better than filling up the cabinet under your kitchen sink with plastic grocery bags. Many grocers are selling reusable bags, but they are SO boring! I bought some from my local supermarket and I decided that I was much too fashionable to carry around one of those drab things. I made a few bags out of beautiful fabrics, and the next time I went to the grocery store I was the most popular girl there 😉 Obviously women are in need of these wonderful bags, so of course I made some more. These can be made out of any fabrics at all, but I prefer cute food prints for mine. As always, we take custom orders. 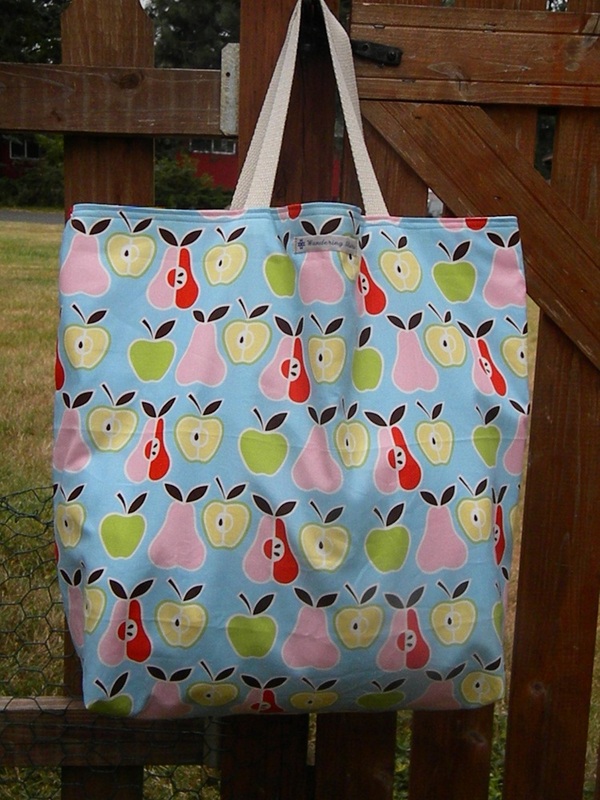 So if you love these bags, but don’t love the fabrics… I can use any print you like. Just ask! 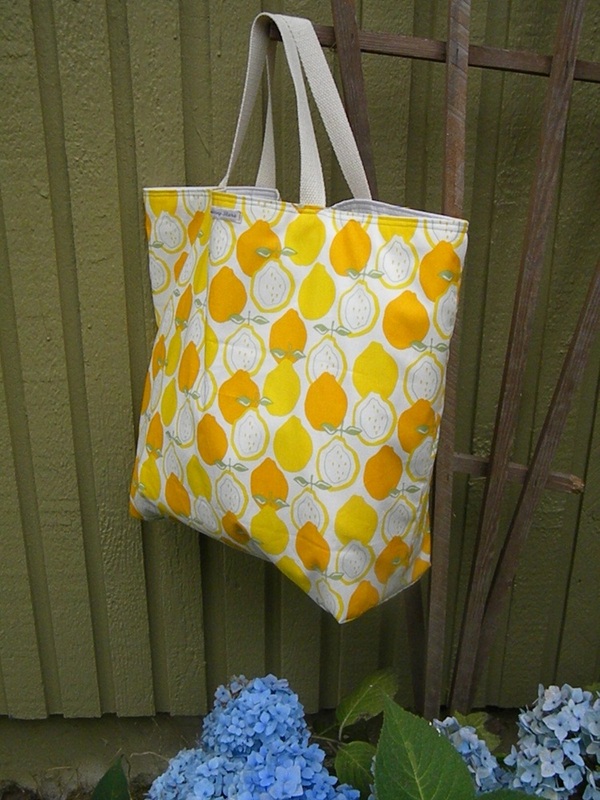 These bags would also be great for the beach or an overnight bag. This quilt gave me fits. It was my first Log Cabin and I had never machine quilted before (I used to do it all by hand, but that takes too long). Lizze had just shown me how to do binding the “proper” way as well. This quilt was a mess waiting to happen. I found the fabrics at my local quilt shop and I just loved them. It was there in the shop that I decided I should make a log cabin quilt. 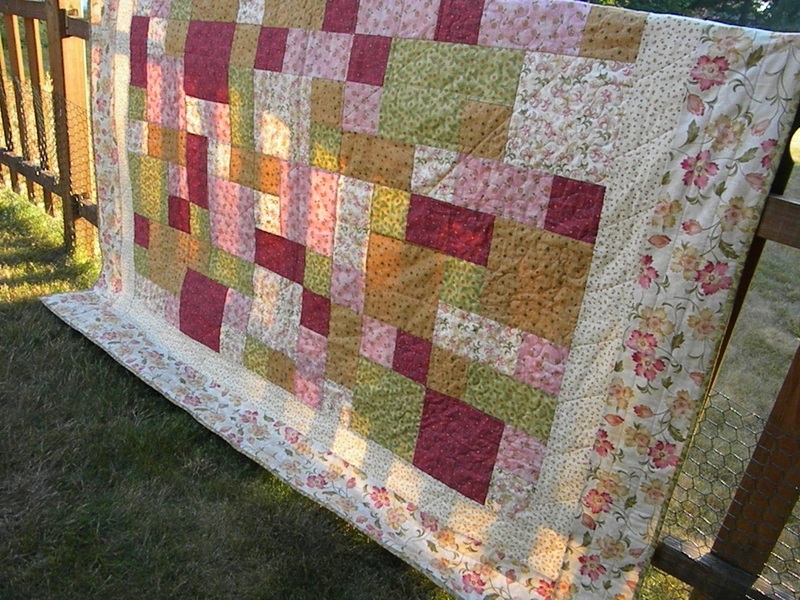 I got the blocks pieced just fine, but then came the quilting. My tension was off and I had big loops on the back. The best part is that I didn’t know until I was ALL DONE since it looked fine on the front. As an inexperienced machine quilter I had no idea that I should stop and check once in awhile to make sure it was nice on both sides. And that weird noise my machine was making? Yes, I ignored it and kept on going. I ended up ripping out all of the quilting I had done and went crying to Lizze’s house. She let me use her Bernina to re-quilt it. Then came the binding… I did it wrong. I was so fed up with this quilt that I just folded it and put it away for months. Recently, I decided to try again. I took off the binding and did it correctly. Now that I have made several quilts using the proper binding technique, I felt much more confident. Now that it has been quilted twice, and bound twice… it is finally done. 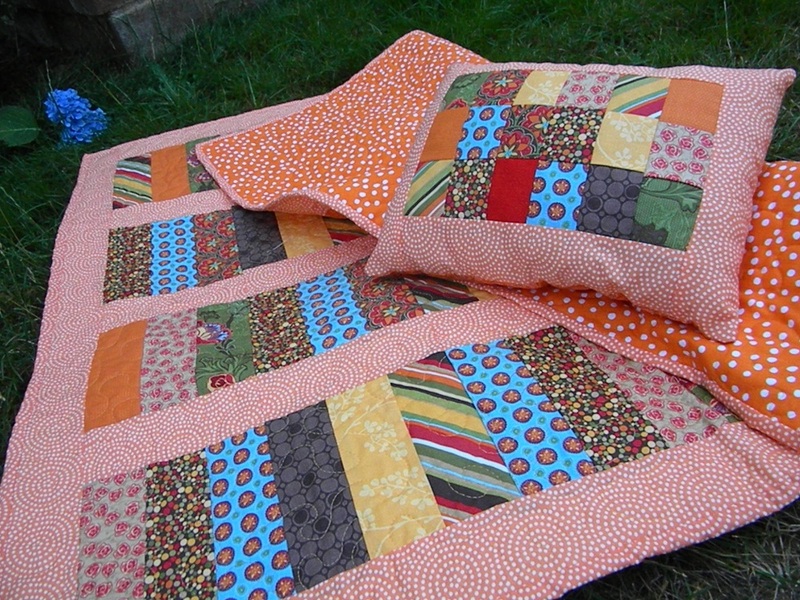 In the meantime, this quilt is listed for sale in our etsy shop (the link is on the right hand side of this page).